Toddler Tables are ideal for feeding, teaching, and other activities with children up to 30 lbs. 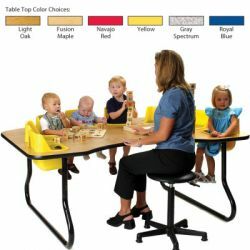 Constructed of high quality, extremely durable 1 1/8" laminate top with bent tubular legs designed for extra strength and support. Removable plastic seats are easy to clean and are each equipped with a seat belt. 72"L x 48" W x 27" H. Weight 120 lbs.